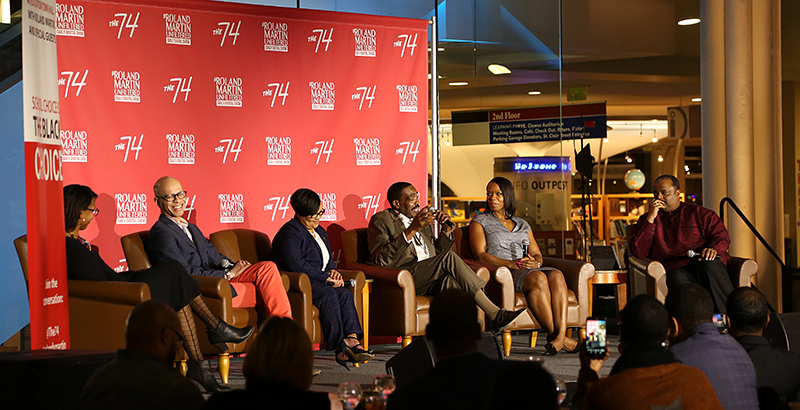 Earlier this month, broadcast journalist Roland Martin and The 74 traveled to Indianapolis to kick off a 10-city “School Choice Is the Black Choice” tour with a town hall and panel discussion organized to engage black families and stakeholders on issues of educational equity, student achievement, and parent involvement. The flexibility Indiana offers to families is unprecedented. In the past 10 years, the state has launched and maintained programs like the Tax Credit Scholarship and the Indiana Choice Scholarship, both of which seek to offer low- and middle-income families the opportunity to send their children to non-neighborhood and tuition-based schools. A 2011 report by the Center for Research on Education Outcomes at Stanford University found that the students in Indiana charter schools make dramatically larger learning gains compared with those in traditional public schools. In Indianapolis Public Schools alone, there are traditional public schools, charter schools, and Innovation Network Schools, which seek to offer curricula more tailored to each school’s student body. “Indy has a whole lot of cooks in the education kitchen,” Martin said, arguing that as a result, the system is convoluted and not effectively serving the city’s black students. None of the city’s schools — whether traditional public, innovation, or charter — are yielding stellar results in black student achievement. On this year’s statewide exams, just 24.5 percent of black students in grades 3-8 passed both the English and math tests, compared with 58 percent of their white peers and 50.7 percent of the state’s students overall. Black students in Indiana also have the highest likelihood of attending a D or F school. For every one black student who is proficient in math and ELA, there are three who are not.